Click here to fill out the volunteer application. If you are interested in production, planning, and execution of the festival, we are presently looking for volunteers in many disciplines, many of which can be done remotely. Our 5th edition will occur April 25-28, 2019. The coming festival will begin approximately noon on Thursday and end Sunday evening about 12:00am for those working behind the scenes. • Festival Pre-Production (Sept 2018 – April 2019 and the majority of work can be done remotely): administration (data entry, submissions tracking, email support, etc. ), social media, special events planning, guest relations, graphic design, web design, proof reading, and more. Festival Production (onsite April 25-28, 2019): special events staff, guest relations, theater operations, merchandising, promotions, social media, ticket sales, graphic design, web design, ushers, greeters and more. There will be volunteer training sessions before the actual event where each person will learn their assignments, be given any necessary training, and meet all the other volunteers at the festival. Scheduling and training for festival Pre-Production volunteers is also provided. However, some positions require previous experience. • A quick learner with the ability to follow through on tasks without micromanagement. 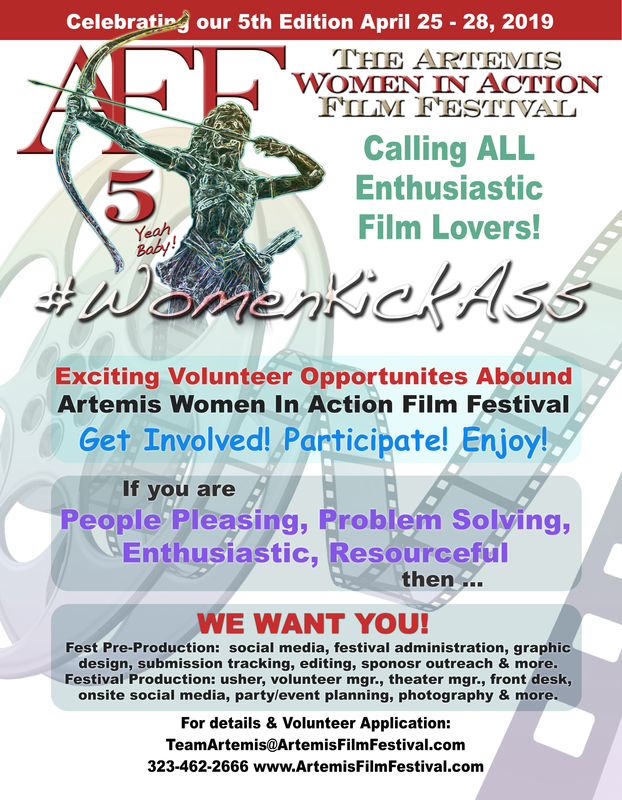 All volunteers will be given an All Access Festival Pass for the entire event that includes all screenings and panels and an Artemis Film Fest T-shirt. It’s also a wonderful opportunity to mix with other film fans and network with industry professionals. Click here to download 2019 Volunteer Flyer.